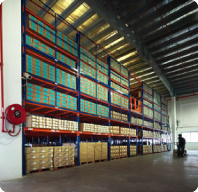 Our prefabrication and warehouse facilities in Singapore and Malaysia enable Deluge Fire Protection to take on fast track projects regardless of size. Our fleet of transport vehicles further ensures the timely and efficient deployment of manpower, materials and equipment to sites. 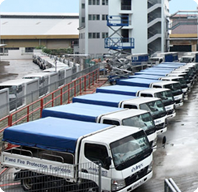 Deluge Fire Protection manages and deploys its own fleet of aerial platforms to support all site construction work. adequately stocked with the necessary materials. restricted workload of up to 230kg (1000lbs). 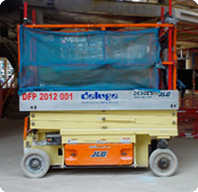 3 Super Lifts designed to transport heavy loads. best access solutions while maintaining ultimate safety. operation of fire protection systems in case of a fire emergency.